The PA12 is a robust, compact 12 input (8 mono, 2 dual stereo) mixer with a straightforward layout and extensive functionality. With a design and build quality that mirrors our professional touring desks, PA12 is an essential addition to any band, school, theatre, or hire inventory. 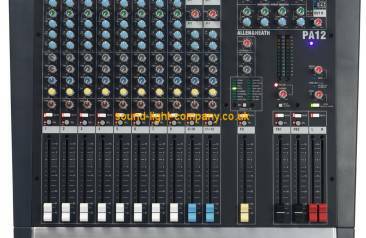 The mic preamp is probably the most important stage in the console's signal path and its performance is often the measure of the quality of the console. The PA Series uses a high grade dualstage design, developed from our acclaimed ML and GL consoles. This ensures optimum matching and very low noise when connecting mic or line sources.